It is a sad day for the people in the field of Economics. Today I’ll write about Elinor Ostrom, the first woman to win a Nobel Prize in Economic Sciences in the year 2009. She passed away this morning at Indiana University’s Health Bloomington Hospital. Elinor was a political scientist; however, she had a deep interest in the science of Economics; more specifically, in understanding how people interact with one another and how they utilize common pool resources, such as forests, fisheries, oil fields, grazing lands, and irrigation systems. She was renowned for her work and efforts in “her analysis of economic governance, especially the commons”. She was the first, and to date, the only woman to win the prize in this category. In other words = LIKE A BOSS! Elinor was born and raised in Los Angeles, California. She grew up in a family of mixed religious background (Protestant and Jewish), and pursued the degree of Political Science at UCLA (from Bachelor’s all the way to Ph.D.). According to her colleagues at Indiana University, she often spoke about what it was like to be a child of the Great Depression, helping her family grow food in a large garden and knitting scarves for soldiers during World War II. 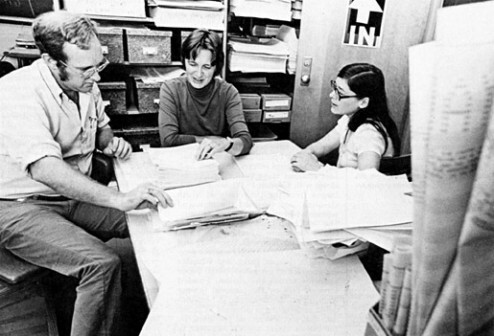 In 1973, she co-founded A Workshop in Political Theory and Policy Analysis at Indiana University with her husband, Vincent Ostrom. Examining the use of collective action, trust, and cooperation in the management of common pool resources, her institutional approach to public policy, known as the institutional analysis and development (IAD) framework, has been considered sufficiently distinct to be thought of as a separate school of Public Choice Theory. 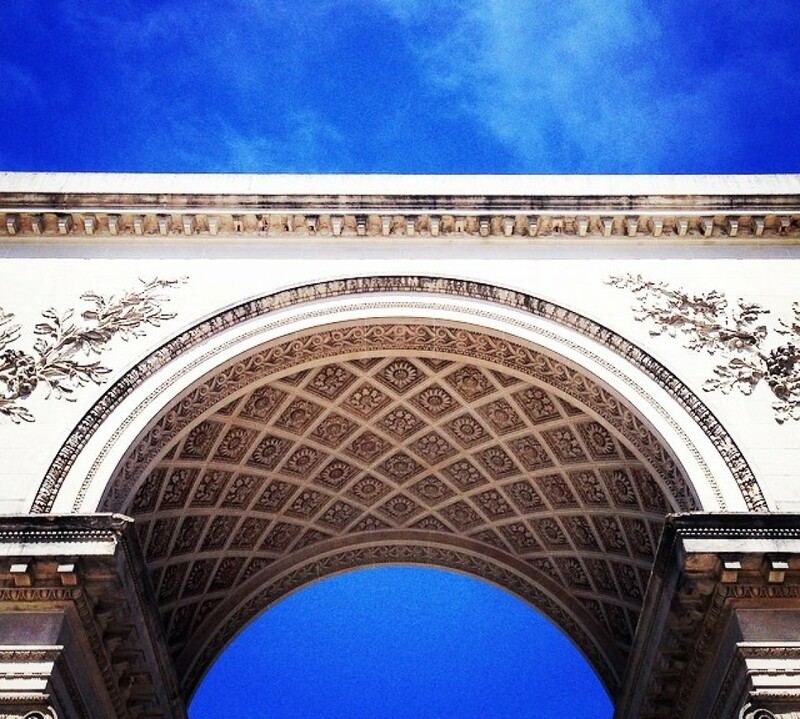 Public Choice Theory models people, institutions and groups as mainly self-interested. In particular, it studies such agents and their interactions in the social system either as such or under alternative constitutional rules. In the realm of political science, for example, Public Choice Theory takes shape in the form of votes, politicians and bureaucrats; where the voter behavior influences the behavior of public officials. 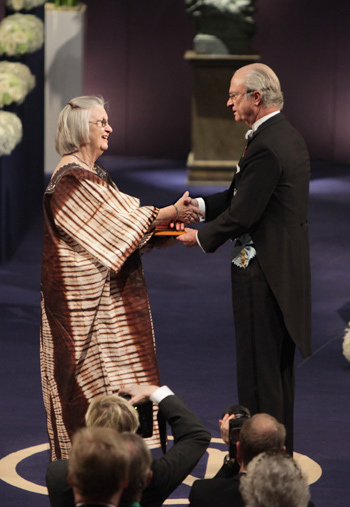 Ostrom, who won a share of the 2009 prize for her groundbreaking research into how people overcome selfish interests to successfully manage natural resources, and are capable of creating rules and institutions that allow for the sustainable and equitable management of shared resources. In essence, how resouces can be managed successfully by the people who use them, rather than by governments or private companies. She shared the prize with Oliver Williamson, a University of California economist. One of the knottiest issues in economics is the tragedy of the commons. But Elinor made it not so tragic, after all. In 1968, young Elinor read an article by Garrett Hardin which posed a classic economic problem: A cow pasture open to everyone. The problem states that everyone would then put their cows on and they would overharvest. That’s the classic tragedy of the commons – everyone uses something, but no one is in charge. So nobody takes it upon themselves to take care of a common good. According to Garret Hardin who posed the problem, he stated that the people who faced this problem are trapped and have no solution. Leading to the conclusion that they require an outside factor to interfere to solve their problem; either the government had to step in and police the pasture or the pasture had to be divided up between the people who used it and privatized. That was the only way to solve the tragic problem, as Hardin saw it. But Ostrom found tons of examples where this didn’t play out. In fact, in the Swiss Alps, there was this exact situation: A pasture with cows on it in the mountains. In the Alps, it’s patchy. And so it snows well in one location, and another one, not much. Therefore, depending on where you placed your cows, you’ll either be lucky, or unlucky, depending on the climate throughout the whole year. Hence, if you fenced it off into small sections, then most of the farmers would be out of luck every year. But just put a fence around the whole thing and everyone benefits. This might be common sense, but considering that economics of the past revolved around the fact that people are only motivated by self-interest, Ostrom’s research expresses the reality that people are not purely motivated by self-interest, and that people have the potential to arise to a better conclusion and outcome through cooperation and pertaining a common goal. Michael McGinnis, a friend and colleague who was at her bedside when she died, said that Ostrom donated her share of the $1.4 million Nobel award money to the workshop — the biggest by far of numerous several academic prizes with monetary awards that the Ostroms had given to the group over the years.